These Patent Pending boxing gloves are a pair unlike any other. Go rounds of Muay-Thai kickboxing sparring or on the punching bag, these gloves are practically indestructible. Made exclusively using extremely durable Kevlar Leather for a long-lasting and practically indestructible product. 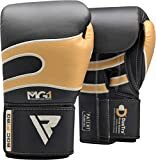 Using the special MG-1 mold to allows equal and efficient shock-dispersion throughout the entirety of the gloves, protecting your hands from hard blows. The multi-layer gel integrated padding with added block padding over wrist offers encompassed protection from the most damaging of shots. The new and exclusive Duotra Strap system Velcro closure is what differentiates these gloves from most, providing highly stable and balanced support to the wrists whilst allowing easy on/off application with a comfy and snug fit. S.P.P perforated ventilation enables moisture to escape glove for a comfy and odour free training experience.